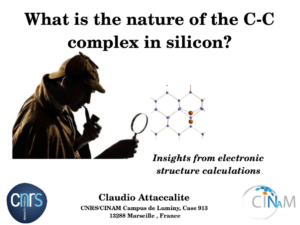 In this work we studied the C-C defect complex in silicon. We used different approaches in such a way to identity the defect configuration responsible for the strong light emission in irradiated silicon. Our clues point towards a particular configuration, even if we suspect that in a damaged sample different type of complexes could be present at the same moment. If you want know more about this investigation have a look to the Presentation or to the manuscript.